“UAV” redirects here. For the entertainment company, see UAV Corporation. For the veterans’ organization, see Ukrainian American Veterans. For other uses of the word “unmanned”, see Unmanned. A group photo of aerial demonstrators at the 2005 Naval Unmanned Aerial Vehicle Air Demo. An unmanned aerial vehicle (UAV), colloquially known as a drone, is an aircraft without a human pilot on board. Its flight is controlled either autonomously by computers in the vehicle or under the remote control of a pilot on the ground or in another vehicle. There are a wide variety of UAV shapes, sizes, configurations, and characteristics. Historically, UAVs were simple remotely piloted aircraft, but autonomous control is increasingly being employed. They are deployed predominantly for military and special operation applications, but also used in a small but growing number of civil applications, such as policing and firefighting, and nonmilitary security work, such as surveillance of pipelines. UAVs are often preferred for missions that are too “dull, dirty or dangerous” for manned aircraft. Ryan Firebee was a series of target drones/unmanned aerial vehicles. The earliest attempt at a powered unmanned aerial vehicle was A. M. Low‘s “Aerial Target” of 1916. Nikola Tesla described a fleet of unmanned aerial combat vehicles in 1915. A number of remote-controlled airplane advances followed during and after World War I, including the Hewitt-Sperry Automatic Airplane. The first scale RPV (Remote Piloted Vehicle) was developed by the film star and model airplane enthusiast Reginald Denny in 1935. More were made in the technology rush during World War II; these were used both to train antiaircraft gunners and to fly attack missions. Nazi Germany also produced and used various UAV aircraft during the course of WWII. Jet engines were applied after World War II in such types as the Teledyne Ryan Firebee I of 1951, while companies like Beechcraft also got in the game with their Model 1001 for the United States Navy in 1955. Nevertheless, they were little more than remote-controlled airplanes until the Vietnam Era. During the 1973 Yom Kippur War, Soviet-supplied surface-to-air missile batteries in Egypt and Syria caused heavy damage to Israeli fighter jets. As a result, Israel developed the first modern UAV. Israel pioneered the use of UAVs for real-time surveillance, electronic warfare, and decoys. The images and radar decoying provided by these UAVs helped Israel to completely neutralize the Syrian air defenses at the start of the 1982 Lebanon War, resulting in no pilots downed. The first time UAVs were used as proof-of-concept of super-agility post-stall controlled flight in combat flight simulations was with tailless, stealth technology-based, three-dimensional thrust vectoring flight control, jet steering UAVs in Israel in 1987. With the maturing and miniaturization of applicable technologies as seen in the 1980s and 1990s, interest in UAVs grew within the higher echelons of the U.S. military. In the 1990s, the U.S. Department of Defense gave a contract to U.S. corporation AAI Corporation of Maryland along with Israeli company Mazlat. The U.S. Navy bought the AAI Pioneer UAV that was jointly developed by American AAI Corporation and Israeli Mazlat, and this type of UAV is still in use. Many of these Pioneer and newly developed U.S. UAVs were used in the 1991 Gulf War. UAVs were seen to offer the possibility of cheaper, more capable fighting machines that could be used without risk to aircrews. Initial generations were primarily surveillance aircraft, but some were armed, such as the General Atomics MQ-1 Predator, which utilized AGM-114 Hellfire air-to-ground missiles. An armed UAV is known as an unmanned combat air vehicle (UCAV). As a tool for search and rescue, UAVs can help find humans lost in the wilderness, trapped in collapsed buildings, or adrift at sea. In February 2013, it was reported that UAVs were used by at least 50 countries, several of which made their own: for example, Iran, Israel and China. The first UAV created was the Pioneer, which helps to identify artillery and boats (Carafano & Gudgel, 2007). Since its performance was so exemplary, they began to be used more and more, with new models constantly being introduced. As of 2008, the United States Air Force employed 5,331 UAVs, which is twice its number of manned planes. Out of these, the Predators are the most commendable. Unlike other UAVs, the Predator was armed with Hellfire missiles so that it can terminate the target that it locates (Carafano & Gudgel, 2007). This was done after Predators sighted Osama Bin Laden multiple times but could not do anything about it other than send back images. In addition, the Predator is capable of orchestrating attacks by pointing lasers at the targets (Singer, 2009b). This is important, as it puts a robot in a position to set off an attack. Their overall success is apparent because from June 2005 to June 2006 alone, Predators carried out 2,073 missions and participated in 242 separate raids (Singer, 2009a). In contrast to the Predator, which is remotely piloted via satellites by pilots located 7,500 miles away, the Global Hawk operates virtually autonomously. The user merely hits the button for ‘take off’ and for ‘land’, while the UAV gets directions via GPS and reports back with a live feed. Global Hawks have the capability to fly from San Francisco and map out the entire state of Maine before having to return. In addition, some UAVs have become so small that they can be launched from one’s hand and maneuvered through the street. These UAVs, known as Ravens, are especially useful in urban areas, such as Iraq, in order to discover insurgents and potential ambushes the next block up (Carafano & Gudgel, 2007). UAVs are especially useful because they can fly for days at a time. According to Carafano & Gudgel, insurgents are loathe to stay in the open for more than a few minutes at a time for fear of UAVs locating them (2007). In the United States, the United States Navy and, shortly after, the Federal Aviation Administration have adopted the name unmanned aircraft (UA) to describe aircraft systems without a flight crew on board. More common names include UAV, drone, remotely piloted vehicle (RPV), remotely piloted aircraft (RPA), and remotely operated aircraft (ROA). These “limited-size” (as defined by the FAI) unmanned aircraft flown in the USA’s National Airspace System, flown solely for recreation and sport purposes, such as models, are generally flown under the voluntary safety standards of the Academy of Model Aeronautics, the United States’ national aeromodeling organization. To operate a UA for non-recreational purposes in the United States, users must obtain a Certificate of Authorization (COA) to operate in national airspace. At the moment, COAs require a public entity as a sponsor. For example, when BP needed to observe oil spills, they operated the Aeryon Scout UAVs under a COA granted to the University of Alaska Fairbanks. COAs have been granted for both land and shipborne operations. For example, the RQ-7 Shadow UAS consists of four UAs, two GCSs, one portable GCS, one Launcher, two Ground Data Terminals (GDTs), one portable GDT, and one Remote Video Terminal. Certain military units are also fielded with a maintenance support vehicle. Because of this systemic approach, unmanned aircraft systems have not been included in the United States Munitions List Category VIII – Aircraft and Associated Equipment. Vice versa, the “Unmanned Aerial Vehicle Systems” are clearly mentioned at paragraph 121-16 Missile Technology Control Regime Annex of the United States Munitions List. More precisely, the Missile Technology Control Regime Annex levels rocket and unmanned aerial vehicle systems together. The term UAS was since adopted by the United States Department of Defense (DOD) and the British Civil Aviation Authority (CAA). The term used previously for unmanned aircraft system was unmanned-aircraft vehicle system (UAVS). The United States military employs a tier system for categorizing its UAVs. The modern concept of U.S. military UAVs is to have the various aircraft systems work together in support of personnel on the ground. The integration scheme is described in terms of a “Tier” system and is used by military planners to designate the various individual aircraft elements in an overall usage plan for integrated operations. The Tiers do not refer to specific models of aircraft but rather roles for which various models and their manufacturers competed. The U.S. Air Force and the U.S. Marine Corps each has its own tier system, and the two systems are themselves not integrated. Tier N/A: Small/Micro UAV. Role filled by BATMAV (Wasp Block III). Tier I: Low altitude, long endurance. Role filled by the Gnat 750. Tier II: Medium altitude, long endurance (MALE). Role currently filled by the MQ-1 Predator and MQ-9 Reaper. Tier II+: High altitude, long endurance conventional UAV (or HALE UAV). Altitude: 60,000 to 65,000 feet (19,800 m), less than 300 knots (560 km/h) airspeed, 3,000-nautical-mile (6,000 km) radius, 24 hour time-on-station capability. Complementary to the Tier III- aircraft. Role currently filled by the RQ-4 Global Hawk. Tier III-: High altitude, long endurance low-observable UAV. Same parameters as, and complementary to, the Tier II+ aircraft. The RQ-3 DarkStar was originally intended to fulfill this role before it was “terminated”. Role now filled by RQ-170 Sentinel. Tier N/A: Micro UAV. Wasp III fills this role, driven largely by the desire for commonality with the USAF BATMAV. Tier I: Role currently filled by the Dragon Eye but all ongoing and future procurement for the Dragon Eye program is going now to the RQ-11B Raven B. Tier II: Role currently filled by the ScanEagle. Tier III: For two decades, the role of medium range tactical UAV was filled by the Pioneer UAV. In July 2007, the Marine Corps announced its intention to retire the aging Pioneer fleet and transition to the RQ-7 Shadow Tactical Unmanned Aircraft System by AAI Corporation. The first Marine Shadow systems have already been delivered, and training for their respective Marine Corps units is underway. Tier I: Small UAV. Role filled by the RQ-11B Raven. Tier II: Short Range Tactical UAV. Role filled by the RQ-7B Shadow 200. Tier III: Medium Range Tactical UAV. Role currently filled by the MQ-5A/B Hunter and IGNAT/IGNAT-ER, but transitioning to the Extended Range Multi-Purpose (ERMP) MQ-1C Gray Eagle. Class I: For small units. Role to be filled by all new UAV with some similarity to micro air vehicle. Class II: For companies (cancelled). Class III: For battalions (cancelled). Class IV: For brigades. Role to be filled by the RQ-8A/B / MQ-8B Fire Scout. A-10PCAS, a Fairchild Republic A-10 Thunderbolt II variant (in development). An unmanned aircraft system (UAS) includes ground stations and other elements besides the actual aircraft. The term was first officially used by the FAA in early 2005 and subsequently adopted by DoD that same year in their Unmanned Aircraft System Roadmap 2005–2030. Many people have mistakenly used the term Unmanned Aerial System or Unmanned Air Vehicle System, as these designations were in provisional use at one time or another. The inclusion of the term aircraft emphasizes that regardless of the location of the pilot and flightcrew, the operations must comply with the same regulations and procedures as do those aircraft with the pilot and flightcrew on board. The official acronym UAS is also used by the International Civil Aviation Organization (ICAO) and other government aviation regulatory organizations. The military role of unmanned aircraft systems is growing at unprecedented rates. In 2005, tactical- and theater-level unmanned aircraft alone had flown over 100,000 flight hours in support of Operation Enduring Freedom and Operation Iraqi Freedom, in which they are organized under Task Force Liberty in Afghanistan and Task Force ODIN in Iraq. Rapid advances in technology are enabling more and more capability to be placed on smaller airframes, which is spurring a large increase in the number of Small Unmanned Aircraft Systems (SUAS) being deployed on the battlefield. The use of SUAS in combat is so new that no formal DoD wide reporting procedures have been established to track SUAS flight hours. As the capabilities grow for all types of UAS, nations continue to subsidize their research and development, leading to further advances and enabling them to perform a multitude of missions. UAS no longer only perform intelligence, surveillance, and reconnaissance missions, although this still remains their predominant type. Their roles have expanded to areas including electronic attack, strike missions, suppression and/or destruction of enemy air defense, network node or communications relay, combat search and rescue, and derivations of these themes. These UAS range in cost from a few thousand dollars to tens of millions of dollars, with aircraft ranging from less than one pound to over 40,000 pounds. When the Obama administration announced in December 2009 the deployment of 30,000 new troops in Afghanistan, there was already an increase of attacks by unmanned Predator UAVs against Taliban and al-Qaeda militants in Afghanistan and Pakistan’s tribal areas, of which one probably killed a key member of al-Qaeda. However, neither Osama bin Laden nor Ayman al-Zawahiri was the likely target, according to reports. According to a report of the New America Foundation, armed UAV strikes had dramatically increased under President Obama – even before his deployment decision. There were 43 such attacks between January and October 2009. The report draws on what it deems to be “credible” local and national media stories about the attacks. This can be compared to a total of 34 in all of 2008, which was President Bush’s last full year in office. Between 2006 and 2009, UAV-launched missiles allegedly had killed between 750 and 1,000 people in Pakistan, according to the report. Of these, about 20 people were said to be leaders of al-Qaeda, Taliban, and associated groups. Overall, 66% to 68% of the people killed were militants, and 31% to 33% were civilians. U.S. officials disputed the percentage for civilians. The U.S. Air Force has recently begun referring at least to larger UAS like Predator, Reaper, and Global Hawk as Remotely Piloted Aircraft (RPA) to highlight the fact that these systems are always controlled by a human operator at some location. However, artificial intelligence is advancing to the point where the aircraft are easily capable of taking off, landing, and flying themselves. Then they simply have to be instructed as to their mission. The military distinguishes between “man in the loop”(piloted) and “man on the loop” (supervised) systems, with “fully autonomous” (issued orders) growing organically from the second into a third category. A.I. systems have been capable of making decisions and planning sequences of actions for decades; as of 2013, few fully autonomous systems have been constructed, but this is more a matter of convenience and technical implementation than of any fundamental barrier. To distinguish UAVs from missiles, a UAV is defined as a “powered, aerial vehicle that does not carry a human operator, uses aerodynamic forces to provide vehicle lift, can fly autonomously or be piloted remotely, can be expendable or recoverable, and can carry a lethal or nonlethal payload”. Therefore, cruise missiles are not considered UAVs because, like many other guided missiles, the vehicle itself is a weapon that is not reused, even though it is also unmanned and in some cases remotely guided. A thermal imaging gimbal pod camera mounted on the side of a Huey UH-1, similar to those used on certain UAVs. An InView UAV used in various scientific and commercial applications. The RQ-7 Shadow is capable of delivering a 20 lb (9.1 kg) “Quick-MEDS” canister to front-line troops. Fulmar UAV, developed by Aerovision for civilian applications. IAI Heron, an Unmanned Aerial Vehicle developed by the Malat (UAV) division of Israel Aerospace Industries. UAVs can be used to perform geophysical surveys, in particular geomagnetic surveys where the processed measurements of the Earth’s differential magnetic field strength are used to calculate the nature of the underlying magnetic rock structure. A knowledge of the underlying rock structure helps trained geophysicists to predict the location of mineral deposits. The production side of oil and gas exploration and production entails the monitoring of the integrity of oil and gas pipelines and related installations. For above-ground pipelines, this monitoring activity could be performed using digital cameras mounted on one or more UAVs. The InView Unmanned Aircraft System is an example of a UAV developed for use in oil, gas, and mineral exploration and production activities. UAVs can transport goods using various means based on the configuration of the UAV itself. Most payloads are stored in an internal payload bay somewhere in the airframe. For many helicopter configurations, external payloads can be tethered to the bottom of the airframe. With fixed-wing UAVs, payloads can also be attached to the airframe, but aerodynamics of the aircraft with the payload must be assessed. For such situations, payloads are often enclosed in aerodynamic pods for transport. Unmanned aircraft are especially useful in penetrating areas that may be too dangerous for manned aircraft. The National Oceanic and Atmospheric Administration (NOAA) began utilizing the Aerosonde unmanned aircraft system in 2006 as a hurricane hunter. AAI Corporation subsidiary Aerosonde Pty Ltd. of Victoria, Australia, designs and manufactures the 35-pound system, which can fly into a hurricane and communicate near-real-time data directly to the National Hurricane Center in Florida. Beyond the standard barometric pressure and temperature data typically culled from manned hurricane hunters, the Aerosonde system provides measurements far closer to the water’s surface than previously captured. Further applications for unmanned aircraft can be explored once solutions have been developed for their accommodation within national airspace, an issue currently under discussion by the Federal Aviation Administration. UAVSI, the UK manufacturer, also produces a variant of their Vigilant light UAS (20 kg) designed specifically for scientific research in severe climates, such as the Antarctic. MQ-1 Predator UAVs armed with Hellfire missiles are increasingly used by the U.S. as platforms for hitting ground targets. Armed Predators were first used in late 2001 from bases in Pakistan and Uzbekistan, mostly aimed at assassinating high profile individuals (terrorist leaders, etc.) inside Afghanistan. Since then, there have been many reported cases of such attacks taking place in Afghanistan, Pakistan, Yemen, and Somalia. The advantage of using an unmanned vehicle rather than a manned aircraft in such cases is to avoid a diplomatic embarrassment should the aircraft be shot down and the pilots captured, since the bombings take place in countries deemed friendly and without the official permission of those countries. A Predator based in a neighboring Arab country was used to kill suspected al-Qaeda terrorists in Yemen on November 3, 2002. This marked the first use of an armed Predator as an attack aircraft outside of a theater of war such as Afghanistan. By October 2009, the CIA claimed to have killed more than half of the 20 most wanted al-Qaeda terrorist suspects in targeted killings using UAVs. By May 2010, counter-terrorism officials said that UAV strikes in the Pakistani tribal areas had killed more than 500 militants since 2008 and no more than 30 (5%) nearby civilians—mainly family members who lived and traveled with the targets. UAVs linger overhead after a strike, in some cases for hours, to enable the CIA to count the bodies and attempt to determine which, if any, are civilians. A Pakistani intelligence officer gave a higher estimate of civilian casualties, saying 20% of total deaths were civilians or non-combatants. CIA officials became concerned in 2008 that targets in Pakistan were being tipped off to pending U.S. UAV strikes by Pakistani intelligence when the U.S. requested Pakistani permission prior to launching UAV-based attacks. The Bush administration therefore decided in August 2008 to abandon the practice of obtaining Pakistani government permission before launching missiles from UAVs, and in the next six months the CIA carried out at least 38 Predator strikes in northwest Pakistan, compared with 10 in 2006 and 2007 combined. In 2012, the USAF trained more UAV pilots than ordinary jet fighter pilots for the first time. One issue with using armed drones to attack human targets is the size of the bombs being used and the relative lack of discrimination of the 100 lb (45 kg) Hellfire, which was designed to eliminate tanks and attack bunkers. Smaller weapons such as the Raytheon Griffin and Small Tactical Munition are being developed as a less indiscriminate alternative, and development is underway on the still smaller US Navy-developed Spike missile. The payload-limited Predator A can also be armed with six Griffin missiles, as opposed to only two of the much-heavier Hellfires. Questions have been raised about the accuracy of UAV-based missile strikes. In March 2009, The Guardian reported allegations that Israeli UAVs armed with missiles killed 48 Palestinian civilians in the Gaza Strip, including two small children in a field and a group of women and girls in an otherwise empty street. In June, Human Rights Watch investigated six UAV attacks that were reported to have resulted in civilian casualties and alleged that Israeli forces either failed to take all feasible precautions to verify that the targets were combatants or failed to distinguish between combatants and civilians. In July 2009, Brookings Institution released a report stating that in the United States-led drone attacks in Pakistan, ten civilians died for every militant killed. S. Azmat Hassan, a former ambassador of Pakistan, said in July 2009 that American UAV attacks were turning Pakistani opinion against the United States and that 35 or 40 such attacks only killed 8 or 9 top al-Qaeda operatives. Although it may never be known how many civilians have died as a result of U.S. UAV strikes in Pakistan, there are estimates of hundreds or thousands of innocent bystanders who have perished in such attacks. Pakistani authorities released statistics indicating that between January 1, 2009 and December 31, 2009, U.S. RQ-1 Predator and RQ-9 Reaper UAV strikes have killed over 700 innocent civilians. The website PakistanBodyCount.Org (by Zeeshan-ul-hassan Usmani, a Fulbright Scholar at the Florida Institute of Technology) shows 1,065 civilian deaths between June 2004 and January 30, 2010 and tallies 103 UAV strikes carried out by the United States. With the increase of UAV strikes, January 2010 proved to be a deadly month in Pakistan with 123 innocent civilians killed, according to a story in The International News. In addition, it has been reported that 160 children have died from UAV-launched attacks in Pakistan. Further, over 1,000 civilians have been injured. This evidence runs counter to the Obama administration’s claim that “nearly for the past year there hasn’t been a single collateral death” due to UAV-based attacks. According to the February 24, 2010 policy analysis “The Year of the Drone” released by the New America Foundation, the civilian fatality rate since 2004 is approximately 32%. The study reports that 114 reported UAV-based missile strikes in northwest Pakistan from 2004 to present killed between 830 and 1,210 individuals, around 550 to 850 of whom were militants. Singer states that “an Air National Guard pilot in an F-16 saw flashing lights underneath him while flying over Afghanistan at twenty-three thousand feet and thought he was under fire from insurgents. Without getting required permission from his commanders, he dropped a 500-pound bomb on the lights. They instead turned out to be troops from Canada on a night training mission” (2009a, p. 43). This is important because if that plane had been a UAV, it would have had more time to make its decision. Since the UAV has long-range cameras, it would have been able to get a visual on the potential target and discover that they were friendly (Singer, 2009a). In addition, it also would not feel fear or adrenaline that could potentially affect the decision of a person who fears for their life (Singer, 2009a). A Bell Eagle Eye, offered to the US Coast Guard. In June 2012, WWF announced it will begin using UAVs in Nepal to aid conservation efforts following a successful trial of two aircraft in Chitwan National Park, with ambitions to expand to other countries, such as Tanzania and Malaysia. The global wildlife organization plans to train ten personnel to use the UAVs, with operational use beginning in the fall. In August 2012, UAVs were used by members of the Sea Shepherd Conservation Society in Namibia to document the annual seal cull. In March 2013, the Times published a controversial story that UAV conservation nonprofit ShadowView, founded by former members of Sea Shepherd Conservation Society, had been working for several months with anti-hunting charity The League Against Cruel Sports to expose illegal fox hunting in the UK; hunt supporters have argued that using UAVs to film hunting is an invasion of privacy. Another application of civil UAVs is the prevention and early detection of forest fires. The chief exponent of this type is the FT-ALTEA, developed by Flightech Systems. The possibility of constant flight, both day and night, makes the methods used until now (helicopters, watchtowers, etc.) become obsolete. Its payload consists of numerous cameras (HD, thermal, hyperspectral, etc.) and multiple sensors that provide real-time emergency services, including information about the location of the outbreak of fire as well as many factors (wind speed, temperature, humidity, etc.) that are helpful for fire crews to conduct fire suppression. UAV design and production is a global activity with manufacturers all across the world. The United States and Israel were initial pioneers in this technology, and U.S. manufacturers had a market share of over 60% in 2006, with U.S. market share due to increase by 5–10% through 2016. Northrop Grumman and General Atomics are the dominant manufacturers in this industry on the strength of the Global Hawk and Predator/Mariner systems. According to the Stockholm International Peace Research Institute, Israeli companies were behind 41% of all UAVs exported in 2001-2011. The European market share represented just 4% of global revenue in 2006. Early UAVs used during the Vietnam War captured video that was recorded to film or tape on the aircraft. These aircraft often flew either in a straight line or in preset circles collecting video until they ran out of fuel and landed. After landing, the film was recovered for analysis. Because of the simple, repetitive nature of these operations, the aircraft were often called “drones”. As new radio control systems became available, UAVs were often remote controlled, and the term “remotely piloted vehicle” came into vogue. Today’s UAVs often combine remote control and computerized automation. More sophisticated versions may have built-in control and/or guidance systems to perform low-level human pilot duties, such as speed and flight-path stabilization, and simple scripted navigation functions, such as waypoint following. In news and other discussions, the term “drone” is still often mistakenly used to refer to these more sophisticated aircraft. From this perspective, most early UAVs were not autonomous at all. In fact, the field of air-vehicle autonomy is a recently emerging field, largely driven by the military to develop battle-ready technology. Compared to the manufacturing of UAV flight hardware, the market for autonomy technology is fairly immature and undeveloped. Autonomy is commonly defined as the ability to make decisions without human intervention. To that end, the goal of autonomy is to teach machines to be “smart” and act more like humans. The keen observer may associate this with the developments in the field of artificial intelligence made popular in the 1980s and 1990s, such as expert systems, neural networks, machine learning, natural language processing, and vision. However, the mode of technological development in the field of autonomy has mostly followed a bottom-up approach, such as hierarchical control systems, and recent advances have been largely driven by the practitioners in the field of control science, not computer science. Similarly, autonomy has been and probably will continue to be considered an extension of the controls field. To some extent, the ultimate goal in the development of autonomy technology is to replace the human pilot. It remains to be seen whether future developments of autonomy technology, the perception of the technology, and, most importantly, the political climate surrounding the use of such technology will limit the development and utility of autonomy for UAV applications. Also as a result of this, synthetic vision for piloting has not caught on in the UAV arena as it did with manned aircraft. NASA utilized synthetic vision for test pilots on the HiMAT program in the early 1980s (see photo), but the advent of more autonomous UAV autopilots greatly reduced the need for this technology. Interoperable UAV technologies became essential as systems proved their mettle in military operations, taking on tasks too challenging or dangerous for troops. NATO addressed the need for commonality through STANAG (Standardization Agreement) 4586. According to a NATO press release, the agreement began the ratification process in 1992. Its goal was to allow allied nations to easily share information obtained from unmanned aircraft through common ground control station technology. Aircraft that adhere to the STANAG 4586 protocol are equipped to translate information into standardized message formats; likewise, information received from other compliant aircraft can be transferred into vehicle-specific messaging formats for seamless interoperability. Amendments have since been made to the original agreement based on expert feedback from the field and an industry panel known as the Custodian Support Team. Edition Two of STANAG 4586 is currently under review. There are many systems available today that are developed in accordance with STANAG 4586, including products by industry leaders such as AAI Corporation, CDL Systems, and Raytheon, all three of which are members of the Custodian Support Team for this protocol. Because UAVs are not burdened with the physiological limitations of human pilots, they can be designed for maximized on-station times. The maximum flight duration of unmanned aerial vehicles varies widely. Internal combustion engine aircraft endurance depends strongly on the percentage of fuel burned as a fraction of total weight (the Breguet endurance equation) and so is largely independent of aircraft size. Solar-electric UAVs hold potential for unlimited flight, a concept originally championed by the AstroFlight Sunrise in 1974 and the much later Aerovironment Helios Prototype, which was destroyed in a 2003 crash. Electric UAVs kept aloft indefinitely by laser power-beaming technology represent another proposed solution to the endurance challenge. This approach is advocated by Jordin Kare and Thomas Nugent. One of the major problems with UAVs is the lack of inflight refueling capability. In 2012, the US Air Force was promoting research that should end in an inflight UAV refueling capability. A UAV-UAV simulated refuelling flight using two Global Hawks was achieved in 2012. One of the uses for a high endurance UAV would be to “stare” at the battlefield for a long period of time to produce a record of events that could then be played backwards to track where improvised explosive devices (IEDs) came from. Air Force Chief of Staff John P. Jumper started a program to create these persistent UAVs, but this was stopped once he was replaced. In 2007, the Defense Advanced Research Projects Agency (DARPA) revealed a program to develop technology for a UAV with an endurance capability of over 5 years. The program, entitled VULTURE (Very-high altitude, Ultra-endurance, Loitering Theater Unmanned Reconnaissance Element), entered Phase II on September 14, 2010, with a contract signed with Boeing for development of the SolarEagle flight demonstrator. Boeing Condor 58 hours 11 minutes 1989 The aircraft is currently in the Hiller Aviation Museum, CA. RQ-4 Global Hawk 33.1 hours March 22, 2008 Set an endurance record for a full-scale, operational unmanned aircraft. Vanguard Defense Industries 2 hours 55 minutes 11 February 2011 VTOL platform carrying an 18 lb payload. Norton Schwartz, former top officer of the USAF, sees future UAVs operating under the control of manned aircraft to make “buddy attacks”. UAVs have been developed and deployed by many countries around the world. For a list of models by country, see: List of unmanned aerial vehicles. The use of unmanned aerial systems, however, is not limited to state powers: non-state actors can also build, buy and operate these combat vehicles. The export of UAVs or technology capable of carrying a 500 kg payload at least 300 km is restricted in many countries by the Missile Technology Control Regime. At the center of the American military’s continued UAV research is the MQ-X, which builds upon the capabilities of the Reaper and Predator UAVs. As currently conceived, the MQ-X would be a stealthier and faster fighter-plane sized UAV capable of any number of missions: high-performance surveillance; attack options, including retractable cannons and bomb or missile payloads; and cargo capacity. China has exhibited some UAV designs, but its ability to operate them is limited by the lack of high endurance domestic engines, satellite infrastructure, and operational experience. During the Persian Gulf War, Iraqi Army forces surrendered to the UAVs of the USS Wisconsin. In October 2002, a few days before the U.S. Senate vote on the Authorization for Use of Military Force Against Iraq Resolution, about 75 senators were told in closed session that Saddam Hussein had the means of delivering biological and chemical weapons of mass destruction by UAVs that could be launched from ships off the Atlantic coast to attack U.S. eastern seaboard cities. Colin Powell suggested in his presentation to the United Nations that they had been transported out of Iraq and could be launched against the U.S. It was later revealed that Iraq’s UAV fleet consisted of only a few outdated Czech training drones. At the time, there was a vigorous dispute within the intelligence community as to whether CIA’s conclusions about Iraqi UAVs were accurate. The U.S. Air Force, the agency most familiar with UAVs, denied outright that Iraq possessed any offensive UAV capability. The first US targeted UAV killing outside the conventional battlefield took place on November 3, 2002, in the Marib district of Yemen. Six alleged terrorists were killed in their SUV by a UAV-fired missile. The command centre was in Tampa, Florida, USA. In December 2002, the first ever dogfight involving a UAV occurred when an Iraqi MiG-25 and a U.S. RQ-1 Predator fired missiles at each other. The MiG’s missile destroyed the Predator. The U.S. deployed UAVs in Yemen to search for and kill Anwar al-Awlaki, an American and Yemen imam, firing at and failing to kill him at least once before he was killed in a UAV-launched missile attack in Yemen on 30 September 2011. The targeted killing of an American citizen was unprecedented. However, nearly nine years earlier in 2002, U.S. citizen Kemal Darwish was one of six men killed by the first UAV strike outside a war zone, in Yemen. In December 2011, Iran captured a United States’ RQ-170 unmanned aerial vehicle that flew over Iran and rejected President Barack Obama‘s request to return it to the US. Iranian officials claim to have recovered data from the U.S. surveillance aircraft. However, it is not clear how Iran brought it down. There have also been claims that Iran spoofed the GPS signal used by the UAV and hijacked it into landing on an Iranian runway. Although UAVs are today most commonly associated with military actions, UAVs are increasingly used by civilian government agencies, businesses, and private individuals. 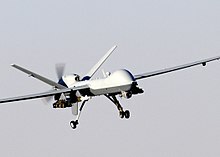 In the United States, for example, government agencies use UAVs such as the RQ-9 Reaper to patrol the nation’s borders, scout property, and locate fugitives. One of the first authorized for domestic usage was the ShadowHawk UAV in service in Montgomery County, Texas, and is being used by their SWAT and emergency management offices. In 2013, The Flemish Research Institute for Nature and Forest and the Flanders Marine Institute planned to use a UAV with a camera and a detection system that automatically recognizes different types of vegetation, trees and individual plants in order to make regular assessments of the biodiversity of the Flemish terrain. Their previous system of using 25 civil servants to map the country was unsatisfactory and time-consuming. In August 2013, the Italian defence company Selex ES provided an unarmed surveillance drone to be deployed in the Democratic Republic of Congo to monitor movements of armed groups in the region and to protect the civilian population more effectively. The Deutsche Bahn (German national railways) said in 2013 that it would test small surveillance UAVs with thermal cameras to prosecute vandals who spray graffiti on its property at night. Graffiti incidents cost the Deutsche Bahn $10 million per year to clean up. T-Hawk and Global Hawk drones were used to gather information about the damaged Fukushima Number 1 nuclear plant and disaster-stricken areas of the Tōhoku region after the March 2011 tsunami. Anti-whaling activists used an Osprey UAV (made by Kansas-based Hangar 18) in 2012 to monitor Japanese whaling ships in the Antarctic. In 2012, the World Wildlife Fund supplied two FPV Raptor 1.6 UAVs to the Nepal National Parks. These UAVs were used to monitor rhinos tigers and elephants and deter poachers. The UAVs were equipped with time lapse cameras and could fly for 18 miles at 650 feet. In 2012 Loitering Theatre group flew Parrot AR.Drones near Áras an Uachtaráin, the Magazine Fort, a prison facility and offices of Google on Barrow Street and also Facebook. Footage filmed by the group was shown at an exhibit run by the Dublin Science Gallery. The Irish Aviation Authority stated that this was prohibited as Dublin city is classed as a restricted area. A separate group, called Tomorrows Thoughts Today, who had attended the same event were detained on their return to the UK at London Southend Airport under the Terrorism Act. They were released after a couple of hours questioning. The IAA policy is that Unmanned Aerial Systems may not be flown without the operator receiving a specific Permission from the IAA. Where such a craft is to be used for commercial work, the operator must apply to the IAA for an Aerial Work Permission from the IAA. Flying UAS outside the direct, unaided line of sight of the operator is not allowed for safety reasons. It is not permitted to use vision-enhancing systems, such as First Person View. On 15 November 2012 the Irish Aviation Authority introduced a requirement that Remotely Piloted Aircraft needed to be registered to comply with Statutory Instrument 634 or 2005 ‘Nationality and Registration of Aircraft’ Order. In December 2012, the Kruger National Park started using a Seeker II UAV aganst rhino poachers. The UAV was loaned to the South African National Parks authority by its manufacturer, Denel Dynamics of South Africa. In 2007 Merseyside Police was reported to be conducting tests with a UAV. In 2010 Merseyside Police caught a car thief with a UAV in 2010, but about a week later had to stop UAV operations as the craft was not licenced as new legislation required. A licence was granted by the Civil Aviation Authority but the UAS was lost during a training exercise in Aigburth when it crashed into the Mersey. Merseyside Police said they would not replace it, citing performance problems and cost of staff training. In 2012, the Ulster Society for the Prevention of Cruelty to Animals used a quadcopter UAV to deter badger baiters in Northern Ireland. In March 2013, the British League Against Cruel Sports announced they had carried out trial flights with UAVs and planned to use a fixed-wing OpenRanger and an Octocopter to gather evidence to make private prosecutions against illegal hunting of foxes and other animals. The UAVs were supplied by ShadowView Ltd, Berkshire. A spokesman for Privacy International said that “licencing and permission for drones is only on the basis of health and safety, without considering whether privacy rights are violated.” The Civil Aviation Authority (United Kingdom) rules are that UAV aircraft less than 20 kilograms in weight must be in direct visual contact with the pilot, cannot fly within 150 meters of a congested area or within 50 meters of a person or vehicle, and cannot be used for commercial activity. Staffordshire police were reported to be using UAVs as alternatives to standard police support units in 2012. A May 2012 report issued by the DHS Inspector General found that CBP “needs to improve planning of its unmanned aircraft systems program to address its level of operation, program funding, and resource requirements, along with stakeholder needs.”  Also, despite the Bureau’s limited mission to safeguard the borders, the Bureau often flies missions for the FBI, the Department of Defense, NOAA, local law enforcement, and other agencies. In December 2011, the CBP made headlines when reporters discovered that the agency’s UAVs were being used to assist local law enforcement in relation to cattle raiding in North Dakota without receiving prior approval from the FAA or any other agency. Individuals in the United States have few legal privacy protections from aerial surveillance conducted through UAVs. In Florida v. Riley, the United States Supreme Court held that individuals do not have the right to privacy from police observation from public airspace. The weakness of legal protection from UAV surveillance have led to calls from civil liberties advocacy groups for the U.S. government to issue laws and regulations that establish both privacy protections and greater transparency regarding the use of UAVs to gather information about individuals. As an example, the ACLU has warned of a “nightmare scenario” in the future where the police might be able, with computer technology, to combine mobile phone tracking with video data and build up a database of people’s routine daily movements. On February 24, 2012, the Electronic Privacy Information Center, joined by over 100 organizations, experts, and members of the public, submitted a petition to the FAA requesting a public rule-making on the privacy impact of UAV use in U.S. airspace. In June 2012, Senator Rand Paul and Representative Austin Scott both introduced legislation that would require law enforcement to obtain a warrant before using a UAV to conduct surveillance of criminal activities. EPIC has stated that transparency and accountability must be built into the FAA’s system of UAV/UAS/RPV regulation in order to provide basic protections to the public. Law enforcement and other government agencies are not the only entities that use UAVs. Private citizens and media organizations use UAVs as well for the purposes of surveillance, recreation, or personal land assessment. Some farming initiatives utilize UAVs for crop spraying, as they are often cheaper than a full-sized helicopter. Occupy Wall Street journalist Tim Pool uses what he calls an Occucopter for live feed coverage of Occupy movement events. The “occucopter” is an inexpensive radio controlled quadcopter with cameras attached and controllable by Android devices or iOS. In February 2012, an animal rights group used a MikroKopter hexacopter to film hunters shooting pigeons in South Carolina. The hunters then shot the UAV down. UAVs also have been shown to have many other civilian uses, such as agriculture, Hollywood, and in the construction industry. In March 2013 an Alitalia pilot on final approach to runway 31 right at John F. Kennedy International Airport reported seeing a small UAV near his aircraft. Both the FAA and FBI were reported to be investigating. In June 2012, Venezuelan President Hugo Chavez claimed that Venezuela had begun producing its own UAV. General Julio Morales added that the UAV had a range of 100 kilometres (about 60 miles), a maximum altitude of 3,000 metres (about 10,000 feet), could fly for 90 minutes, measured three by four metres, and was a part of a system to survey and monitor pipelines, dams, and other rural infrastructure. General Morales was the president of the state-run Cavim arms manufacturer that developed the aircraft. In May 2013, The Vietnam Space Technology Institute successfully conducted 37 UAV flights in the central Lam Dong province. Research for the UAVs began in 2008 and was later funded by the state in 2011. In America alone there are thousands of civilian operators of UAVs working for contractors. They are engaged in both the piloting and repair of UAVs. According to a 2011 study by the Air Force School of Aerospace Medicine, nearly 50% of operators of UAVs suffer from high stress levels. Sam Trevino, president of the Association of Unmanned Operation (AUO), a new union that aims to represent civilian UAV operators, is concerned about long working hours and decreasing wages; with growing discontent among operators. UAVs have been used in many episodes of two recent science-fiction television series, Stargate SG-1 and Dark Angel. A UCAV AI, called EDI, was central to the sci-fi action film Stealth. UAVs are also used in video games, such as F.E.A.R., inFamous, Tom Clancy’s Ghost Recon, and the popular Call of Duty and Battlefield franchises. In February 2013, Fairleigh Dickinson University‘s PublicMind poll found that 48% of American voters believe it is “illegal for the U.S. government to target its own citizens living abroad with drone attacks. Just 24% say that it’s legal.” “The public clearly makes an assumption very different from that of the Obama administration or Mr. Brennan: the public thinks targeting American citizens abroad is out of bounds,” Peter Woolley, founding director of PublicMind and professor of political science at FDU, said to CNN. In the same poll, however, by a wide six-to-one margin (75% vs.13%), voters approved of the U.S. military using UAVs to carry out attacks abroad “on people and other targets deemed a threat to the U.S.” Republicans, men, and whites approve more strongly than Democrats, women, and non-whites, but approval is robust in all demographic categories. Voters also approve of the CIA using UAVs to carry out attacks abroad by a strong three-to-one margin (65% vs. 21%), but this approval is significantly less than approval for the U.S. military carrying out such attacks. The “unmanned” aspect of UAVs is primarily what sets them apart from manned aircraft. This aspect also raises certain moral concerns. Some believe that the asymmetry of fighting humans with machines that are controlled from a safe distance lacks integrity and honor that was once valued during warfare. Others feel that if such technology is available, then there is a moral duty to employ it in order to save as many lives as possible. Another potential moral issue with UAVs is that because they do not allow for pilot casualties, some fear that they will be used more frivolously, and that human lives affected by UAV-based strikes will not be regarded with as much consideration as with manned aerial attacks. ^ , “Air Force officials announce remotely piloted aircraft pilot training pipeline”, www.af.mil, June 9, 2010. ^ Pir Zubair Shah, “Pakistan Says U.S. Drone Kills 13”, New York Times, June 18, 2009. ^ a b c Taylor, A. J. P. Jane’s Book of Remotely Piloted Vehicles. ^ Dempsey, Martin E. Eyes of the Army – U.S. Army Roadmap for Unmanned Aircraft Systems 2010–2035 Size: 9MB United States Army, 9 April 2010. Accessed: 6 March 2011. ^ Mayer. “The Predator War”. Retrieved 2009. ^ Radsan, AJ; Murphy (2011). “Measure Twice, Shoot Once: Higher Care for Cia-Targeted Killing”. Univ. Ill. Law Rev.:1201–1241. ^ “A Brief History of UAVs”. ^ “Russia Buys A Bunch Of Israeli UAVs”. ^ Azoulai, Yuval (October 24, 2011). “Unmanned combat vehicles shaping future warfare”. Globes. ^ Levinson, Charles (January 13, 2010). “Israeli Robots Remake Battlefield”. The Wall Street Journal. p. A10. Retrieved January 13, 2010. ^ Gal-Or, Benjamin (1990). Vectored Propulsion, Supermaneuverability & Robot Aircraft. Springer Verlag. ISBN 3-540-97161-0. ^ a b c d e Singer, Peter W. “A Revolution Once More: Unmanned Systems and the Middle East”, The Brookings Institution, November 2009. ^ “FAA: Certificate of Authorization or Waiver (COA)”. ^ “Unmanned aircraft to assist oil spill response”. ^ “Aeryon Scout™ Micro-UAV Provides Aerial Perspective for Ship-Based Wildlife Research Project in Bering Sea”. ^ Gaszczak, A; T.P. Breckon, J.W. Han (January 2011). Proc. SPIE Conference Intelligent Robots and Computer Vision XXVIII: Algorithms and Techniques 7878 (78780B). doi:10.1117/12.876663 http://dx.doi.org/10.1117/12.876663 |url= missing title (help). ^ a b Lundin, Leigh (2013-02-03). “Eye in the Sky”. UAV Drones. Orlando: SleuthSayers. ^ a b Lundin, Leigh (2013-02-10). “Spy in the Sky”. UAV Drones. Orlando: SleuthSayers. ^ Hightower, Jim (2013-01-25). “Here come the drones”. Domestic Drones. Austin: Saddle-Burr Productions. ^ Hightower, Jim (2013-02-05). “The drone-industrial complex wants 30,000 eyes in the sky spying on us Americans by 2020”. Domestic Drones. Austin: Saddle-Burr Productions. ^ Tim Phillips, “Manufacturers Market UAVs Before the Law Specifies How they can be Used”, Activist Defense, February 16, 2013. ^ “Our UAV”. Universal Wing. 2005-07-28. Retrieved 2012-03-31. ^ “InView papers and presentations”. Barnardmicrosystems.com. Retrieved 2012-03-31. ^ For a couple of examples, see the videos Construction with Quadrotor Teams and Flying Robots Build a 6-Meter Tower. ^ Sauer, Frank/Schoernig Niklas, 2012: Killer drones: The ‘silver bullet’ of democratic warfare?, in: Security Dialogue 43 (4): 363–380, http://sdi.sagepub.com/content/43/4/363.abstract, last accessed September 1, 2012. ^ a b c d e Greg Miller (March 22, 2009). “U.S. missile strikes said to take heavy toll on Al Qaeda”. Los Angeles Times. Retrieved May 19, 2010. ^ Terry Gross, host (October 21, 2009). “Jane Mayer: The Risks Of A Remote-Controlled War”. NPR. Retrieved May 20, 2010. ^ “U.S. Approval of Killing of Cleric Causes Unease”, Scott Shane, The New York Times, May 13, 2010. Retrieved October 17, 2010. ^ a b c Entous, Adam (May 19, 2010). “How the White House learned to love the drone”. Reuters. Retrieved October 17, 2010. ^ Will UAVs displace fighter jets soon? ^ “AUVSI: Raytheon designing UAV-specific weapons”. Retrieved December 19, 2010. ^ The Guardian, March 23, 2009. “Cut to pieces: the Palestinian family drinking tea in their courtyard: Israeli unmanned aerial vehicles—the dreaded drones—caused at least 48 deaths in Gaza during the 23-day offensive.” Retrieved on August 3, 2009. ^ “Precisely Wrong: Gaza Civilians Killed by Israeli Drone-Launched Missiles”, Human Rights Watch, June 30, 2009. ^ “Israel/Gaza: Civilians must not be targets: Disregard for Civilians Underlies Current Escalation”. Human Rights Watch. December 30, 2008. Retrieved August 3, 2009. ^ Newsweek, July 8, 2009. Anita Kirpalani, “Drone On. Q&A: A former Pakistani diplomat says America’s most useful weapon is hurting the cause in his country.” Retrieved on August 3, 2009. ^ Peter Bergen and Katherine Tiedemann (October 18, 2009). “Revenge of the Drones”. New America Foundation. Retrieved 2011-09-20. ^ “Home”. PakistanBodyCount.org. Retrieved 2012-03-31. ^ Woods, Chris (August 11, 2011). “Over 160 children reported among drone deaths”. The Bureau of Investigative Journalism. Retrieved 2011-09-20. ^ Woods, Chris (August 10, 2011). “You cannot call me lucky – drones injure over 1,000”. The Bureau of Investigative Journalism. Retrieved 2011-09-20. ^ Muhammad Idrees Ahmad (July 30, 2011). “Fighting Back against the CIA drone war”. Al Jazeera. Retrieved 2011-09-20. ^ Peter Bergen and Katherine Tiedemann. “2004–2011”. New America Foundation. Retrieved 2011-09-10. ^ Carter, Jimmy (June 24, 2012). “A Cruel and Unusual Record”. New York Times. ^ “Police use drone helicopter in search”. ^ “Drones to protect Nepal’s endangered species from poachers”. BBC News. June 20, 2012. ^ “Sea Shepherd Aerial drone to monitor seal slaughter”. August 31, 2012. ^ “Animal activists to use drones in fight against illegal hunting”. March 16, 2013. ^ “Animal welfare charity is to use DRONES to spy on people illegally hunting”. March 17, 2013. ^ Gertler, J. “U.S Unmanned Aerial Systems”. ^ a b c “UAVs on the Rise.” Dickerson, L. Aviation Week & Space Technology. January 15, 2007. ^ “Israel – an unmanned air systems (UAS) super power”. Defense Update. ^ Shim, D. H, Kim, H. J., Sastry, S., Hierarchical Control System Synthesis for Rotorcraft-based Unmanned Aerial Vehicles. ^ Boucher, Roland (undated). “Project Sunrise pg 1”. Retrieved September 23, 2009. ^ Boucher, Roland (undated). “Project Sunrise pg 13”. Retrieved September 23, 2009. ^ Newcome, Laurence R. (2004). Unmanned aviation: a brief history of unmanned aerial vehicles. Retrieved September 23, 2009. ^ Curry, Marty (March 2008). “Solar-Power Research and Dryden”. Retrieved September 15, 2009. ^ “Wireless Power for UAVs”. 2010. ^ “Boeing Wins DARPA Vulture II Program” (Press release). Boeing. 2010-09-16. Retrieved 2012-01-01. ^ “Spies That Fly: Time Line of UAVs”. PBS NOVA. ^ “Heron 1”. Israel Aerospace Industries. ^ “iranian new uavs” (in (Persian)). mashreghnews.ir. ^ “Ekonomİ İnsansız Hava Aracı Geliştirme Projesi imzalandı ZAMAN” (in (Turkish)). Zaman.com.tr. Retrieved 2012-03-31. ^ Thomson, Iain. “US Navy buys Linux to guide drone fleet.” The Register, 8 June 2012. ^ Leyden, John. “US killer spy drone controls switch to Linux.” The Register, 12 January 2012. ^ Majumdar, Dave. “Anti-access/area denial challenges give manned aircraft edge over UAVs.” Flight International, 25 July 2012. ^ Singer, Peter W. “How the US Military Can Win the Robotic Revolution”, The Brookings Institution, 17 May 2010. ^ Axe, David. “US Drones Trump China Theatrics” The Diplomat, 7 February 2011. ^ Federation of American Scientists. Pioneer Short Range (SR) UAV. Accessed November 26, 2006. ^ National Air and Space Museum, Smithsonian Institution. Pioneer RQ-2A September 14, 2001. Accessed November 26, 2006. ^ Pilotless Warriors Soar To Success, www.cbsnews.com, April 25, 2004. Accessed April 21, 2007. ^ Coughlin, Con; Sherwell, Philip (May 2, 2010). “American drones deployed to target Yemeni terrorist”. The Daily Telegraph (London). ^ “Anwar al-Awlaki Targeted By U.S. Drones After Osama Bin Laden Raid”. ABC News. 2011-05-06. Retrieved 2011-09-30. ^ “Obama says U.S. has asked Iran to return drone aircraft”. CNN. December 15, 2011. ^ “Ahmadinejad: Iran has ‘been able to control’ U.S. drone”. CNN. December 15, 2011. ^ Pasztor, Andy; Emshwiller, John (April 21, 2012). “Drone Use Takes Off on the Home Front”. The Wall Street Journal. ^ Campoy, Ana (December 13, 2011). “The Law’s New Eye in the Sky”. The Wall Street Journal. ^ Michelle Nichols (1 August 2013). “Italian firm to provide surveillance drone for U.N. in Congo”. Reuters. ^ a b “Aerial assault on Facebook and Google as part of Dublin ‘Hack the City’ attempt (video)”. Silicon Republic. 21 June 2012. Retrieved 6 July 2013. ^ a b “Drone group held under terrorist act at London airport after Dublin show”. TheJournal.ie. 22 June 2012. Retrieved 6 July 2012. ^ a b “Quadcopter drone group held in London airport on suspicion of terrorism”. Silicon Republic. 22 June 2012. Retrieved 6 July 2013. ^ a b c d e f “Operation of Unmanned Aircraft Systems in Irish Airspace”. Irish Aviation Authority. Retrieved 6 July 2013. ^ “APPLICATION TO OPERATE AN UNMANNED AIRCRAFT SYSTEM”. Irish Aviation Authority. Retrieved 6 July 2013. ^ “Irish Aviation Authority (Rockets and Small Aircraft) Order, 2000”. Irish Aviation Authority. Retrieved 6 July 2013. ^ “Registration Requirements for Remotely Piloted Aircraft (RPA)”. Irish Aviation Authority. Retrieved 6 July 2013. ^ “IRISH AVIATION AUTHORITY (NATIONALITY AND REGISTRATION OF AIRCRAFT) ORDER, 2005”. Irish Aviation Authority. Retrieved 6 July 2013. ^ “Police test drone spy helicopters”. BBC News. 21 March 2007. Retrieved 10 July 2013. ^ “Pilotless police drone takes off”. BBC News. 21 May 2007. Retrieved 10 July 2013. ^ “Unlicensed Merseyside Police drone grounded”. BBC News. 16 February 2010. Retrieved 10 July 2013. ^ “Eye in the sky arrest could land police in the dock”. The Guardian. 15 February 2010. Retrieved 10 July 2013. ^ a b “Police drone crashes into River Mersey”. BBC News. 31 October 2011. ^ Harley Geiger (2011-12-21). “The Drones Are Coming”. Center for Democracy & Technology. Retrieved 2012-01-17. ^ Jennifer Lynch (2012-01-10). “Drones are Watching You”. Electronic Frontier Foundation. Retrieved 2012-06-19. ^ Jennifer Lynch (2012-04-19). “FAA Releases Lists of Drone Certificates—Many Questions Left Unanswered”. Electronic Frontier Foundation. Retrieved 2012-06-19. ^ Amie Stepanovich. “Unmanned Aerial Vehicles and Drones”. Electronic Privacy Information Center. Retrieved 2012-06-19. ^ Bennett, Brian (December 10, 2011). “Police Employ Predator Plane Spy Drones on Home Front”. Los Angeles Times. ^ Harley Geiger (2011-12-21). “How Congress Should Tackle the Drone Privacy Problem”. Center for Democracy & Technology. Retrieved 2012-03-27. ^ Amie Stepanovich (2012-06-12). “New Report Finds Border Surveillance Drone Program Inefficient and Ineffective”. Electronic Privacy Information Center. Retrieved 2012-06-19. ^ Amie Stepanovich (2012-05-09). “EPIC Stresses Need For Privacy Evaluation in Drone Testing”. Electronic Privacy Information Center. Retrieved 2012-06-19. ^ Calo, M. Ryan (December 12, 2011). “The Drone as Privacy Catalyst”. Stanford Law Review Online. 64 (Stanford Law School). Stan. L. Rev. Online (29). ISBN 0038-9765 Check |isbn= value (help). ISSN 1939-8581. Archived from the original on December 31, 2011. Retrieved December 31, 2011. ^ a b McGeehan, Patrick; Goldstein, Joseph (5 March 2013). “Pilot Says Drone Flew Past Jet Nearing J.F.K.”. The New York Times. Retrieved 4 August 2013. ^ a b Kravets, David (5 March 2013). “FBI Investigating Unidentified Drone Spotted Near JFK Airport”. Wired. Retrieved 4 August 2013. ^ a b Mulrine, Anna (5 March 2013). “Mystery drone near JFK airport: FBI seeks public’s help in investigation”. The Christian Science Monitor. Retrieved 4 August 2013. ^ a b Muskal, Michael (5 March 2013). “FAA investigating report of drone aircraft over JFK airport”. Los Angeles Times. Retrieved 4 August 2013. ^ Maierbrugger, Arno (22 May 2013). “Vietnam builds its own drones”. Inside Investor. Retrieved 30 May 2013. ^ Fairleigh Dickinson University’s PublicMind. (February 7, 2013) Public Say It’s Illegal to Target Americans Abroad as Some Question CIA Drone Attacks Press release. ^ Shane, Scott (August 11, 2011). “C.I.A. Is Disputed on Civilian Toll in Drone Strikes”. The New York Times. Retrieved July 2, 2013. ^ Etzioni, Amitai (March-April 2013). “The Great Drone Debate”. Military Review. ^ a b c d e f Isikoff, Michael. “Justice Department memo reveals legal case for drone strikes on Americans”. Retrieved 2013. Wagner, William. “Lightning Bugs and other Reconnaissance Drones; The can-do story of Ryan’s unmanned spy planes”. 1982, Armed Forces Journal International, in cooperation with Aero Publishers, Inc.
, sUAS News and commentary relevant to the global UAS community. This article uses material from the Wikipedia article Unmanned Aerial Vehicle, which is released under the Creative Commons Attribution-Share-Alike License 3.0.